Every year the Oregon Chapter of APCO/NENA, ( Association of Professional Communications Operators, National Emergency Number Association ) gathers to recognize the outstanding individuals and their accomplishments in emergency dispatching. 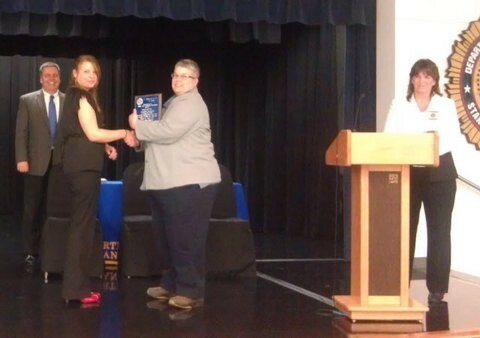 Each 911 Center can nominate any of their Dispatchers they feel went above and beyond in several different categories. Though Astoria 9-1-1 is considered a small Center, we have truly outstanding employees standing ready to answer the call of duty! Below are some of the awards received on behalf of Astoria 9-1-1 as well as individual awards. At a recent Command Staff meeting Dispatchers Kristen Sodervick, Melanie Kinney and Jennifer Peden were recognized for various achievements. Kristen received the Departments Notice of Achievement for her “tenacious” work on having a helicopter assist local Fire Agencies locate an elusive brush fire in the Warrenton area. Dispatcher Melanie Kinney was awarded the Departments Distinguished Service Commendation for her “quick and professional” response to a recent report of suspicious activities near a school. Jennifer Peden was presented with her Intermediate Telecommunicator certificate from the Department of Public Safety Standards and Training. It’s gratifying to me to see these hard working, caring Dispatchers recognized for their great work and their commitment to this profession said Astoria 9-1-1 Manager Jeff Rusiecki. At a recent July 2016 Astoria Police Staff meeting Police Chief Brad Johnston had the pleasure of recognizing three Astoria 9-1-1- Dispatchers. 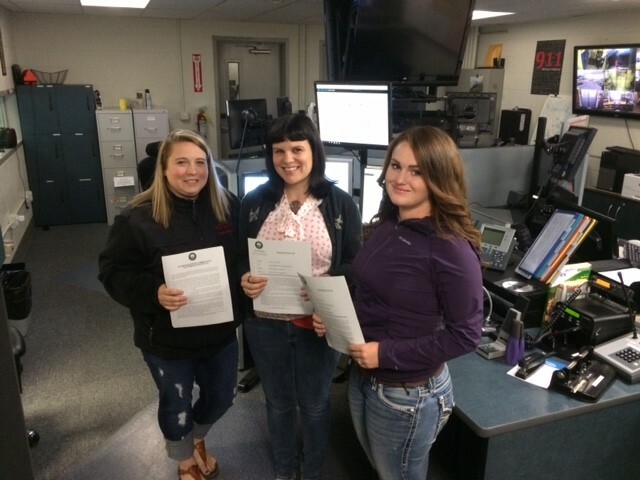 These three were cited for superior performance of duties by Emergency Communications Manager Jeff Rusiecki. 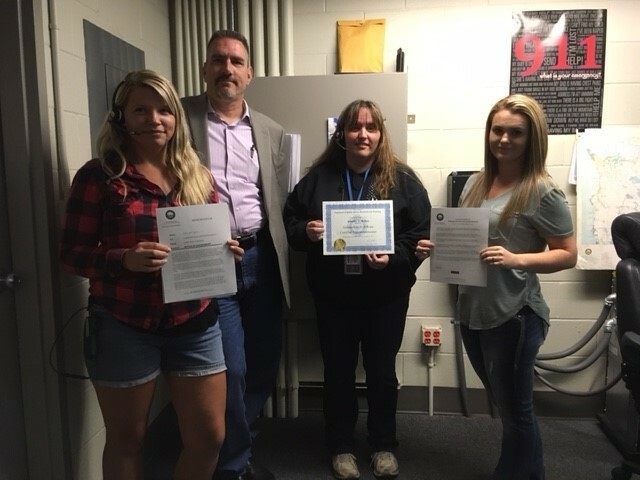 Honored today were Dispatchers Summer Bartlett who received a Distinguished Service Commendation, and Candace Pozdolski and Melanie Hughes who both received a Notice of Recognition. Dispatcher Bartlett was presented with a Distinguished Service Commendation for her performance of duties on December 14th, 2015. Her citation included the following: During her early morning shift she handled a residential structure fire, missing and endangered elderly resident, and a hit and run involving a grade school aged child. Any one of these incidents alone would be challenging but given all three occurring during the same shift is noteworthy. Summer dispatched four different Fire Departments to the structure fire and then coordinated multiple agencies to search for the missing elderly person. This required the coordination of City, County, State and Federal partners to activate all appropriate mechanisms to get the word out to the public. Dispatcher Summer Bartlett’s ability to successfully manage multiple significant incidents is a direct reflection of her dedication and commitment to this profession. Her multi-tasking skills, performance under extreme pressure and ability to adapt exemplify the highest traditions of public safety dispatching. On the 11th of October, 2015 Dispatchers Candace Pozdolski and Melanie Hughes were recognized for their outstanding team work and multi-tasking abilities during a domestic disturbance call which involved the discharge of a firearm. Between the two Disaptchers multiple law enforcement units were sent, Fire and EMS were staged out of harms way, and a perimeter was established to locate the suspect. A search of the residence also uncovered a World War II grenade which required the response of the Oregon State Police Bomb Squad. Dispatchers Pozdolski and Hughes ability to successfully manage a complex and dynamic incident without harm to any first responders are a direct reflection of their dedication and commitment to this profession. Both demonstrated extraordinary multi-tasking skills while remaining calm and professional under extreme pressure while displaying great talent adapting to a highly charged and emotional 911 caller. The teamwork demonstrated between the two was exemplary and in keeping with the highest traditions of public safety dispatching. I could not be prouder of these three 9-1-1 professionals Rusiecki said. We have a highly trained and dedicated Staff and so often take the great work they do daily for granted. This was an excellent opportunity to recognize these three for some extraordinary work! Dispatcher Shirley Krepky – State Critical Incident Award in special recognition for her outstanding performance handling a critical incident on May 7, 2013. Shirley’s extraordinary effort is a credit to the Telecommunications profession and the State of Oregon. Dispatcher Summer Bartlett – Local Life Saver Award in recognition of her quick and decisive actions dispatching Fire and EMS personnel to a severely injured worker. Summer, without hesitation dispatched First Responders prior to being asked. Summers pivotal actions shaved several minutes off the injured worker receiving lifesaving first aid, which according to medical authorities made all the difference in the patients favorable outcome. 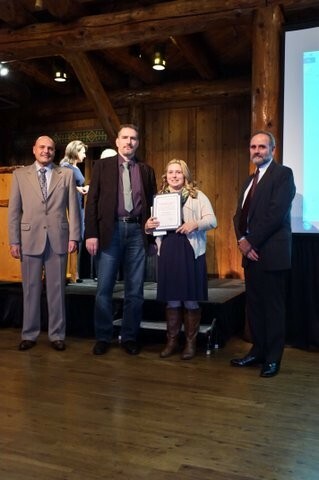 On October 24, 2013 the annual awards ceremony for the Oregon Association of Public-Safety Communications Officers and National Emergency Number Association (APCO/NENA) was held. Several awards were presented to members of the Astoria Police Department and its contractors. Receiving awards were Jodie Frost, Summer Bartlett, Jeff Rusiecki, who are city of Astoria employees; Al Jaques (Project Manager – CM Services Co), Marcus Handy (Network Services Manager/MCSA – iFocus Consulting); CenturyLink; Day Wireless; and Watson Furniture. “These awards are a reflection of the daily work, exceptional professionalism, and character exhibited daily by the men and women of the department,” said Deputy Chief Brad Johnston. "We are fortunate to have the opportunity to work with so many great employees and contractors." APCO/NENA has two level of awards, Local and Statewide. Local Awards allow an agency the opportunity to provide recognition at a local level with the endorsement of APCO/NENA and are awarded for extremely noteworthy contributions. State Awards offer an agency the opportunity to recognize excellence in contributions, performance and achievements by industry personnel and partners – locally, regionally and statewide. 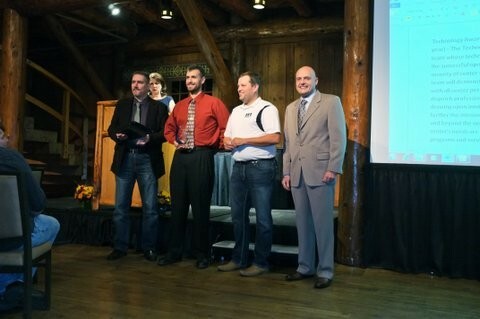 The APCO/NENA Technology Award was awarded recognizing the work of Emergency Communications Center Manager (ECM) Jeff Rusiecki, Al Jaques – Project Manager; Marcus Handy – IT Support; Scott Miller and Tim Kazee – employees of Century Link; Matt Enser and Tony Wherry – Day Wireless, Longview; Thad Parker – Watson Dispatch Furniture, and the Astoria 911 Dispatch Staff. This award was given for the project of moving a working dispatch center from their permanent home to a construction trailer that was located in the fire bay of the public safety building. On July 12th 2012 a 10x42 office trailer was positioned inside one of three working fire bays. The trailer was connected to a uninterruptible power supply, had over 100 Cat 6 data cables and radio umbilical were run overhead between the server/radio room and the trailer. On August 8, 2012 a team gathered at 11:30 PM and began the move. Starting at midnight a dispatch position was broken down then reestablished in the trailer. This requires several systems that interrelate but are the responsibility of different vendors to be coordinated between the various disciplines of the team. Once the first console was reassembled, tested, and ready a dispatcher was stationed in the trailer and the remaining consoles were moved from the dispatch center to the trailer. For five months the center successfully operated while housed in the trailer. On the morning of January 4th the team completed the second move into the refurbished dispatch center. This dispatch center was not equipped with all new equipment but required the equipment relocated to the trailer to be relocated into the dispatch center.This entire operation was conducted while maintaining continuity of operations. No calls were missed, no radio traffic ignored. The ability of the multiple disciplines to work hand in hand to accomplish this smooth transition is a testament to the professionalism of all involved. A Local Critical Incident Award was awarded to Communications Officer Jodie Frost. Ms Frost was recognized for her compassion and professionalism in the way she handled calls both of which involved gunshot injuries. The first was a fatal suicide and the second a self defense incident. During both calls Ms. Frost kept the callers calm, dispatched a myriad of first responders and kept information flowing between all responders aiding in their safety until the scenes were secured. Sadly, these tragedies occur. What they all have in common is that there a 911 dispatcher is usually the first point of contact and is relied upon by all to coordinate the responders while doing their best to ensure that everyone remains safe and the scene is stable. Pictured in top photo left to right: Emergency Communications Manager Jeff Rusiecki, Network Manager/MCSA Marcus Handy (iFocus Consulting), Thad Parker Watson Furniture and President Mark Spross APCO. Pictured in lower photo left to right: Emergency Communications Manager Jeff Rusiecki, Communications Officer Summer Bartlett. Dispatcher Jodie Frost is nominated for a critical incident award for her exemplary performance of duties in relation to two separate shooting incidents. The first incident occurred on the 23 of February 2013 at 1345 hours. At that time Jodie was one of two Dispatchers on shift when she answered a 911 call from a distraught and hysterical female caller. Jodie used her years of experience to calm the caller down and get the critical initial call information. The caller was reporting her 19 year old daughter had just shot herself. Jodie immediately reassured the caller that help was being sent and conferenced EMS personnel on to the call. As the EMS persons began the triage process with the caller Jodie dispatched the Sheriff's Office and Fire Rescue. Jodie stayed on the line with the heart broken mother throughout the incident doing her best to assure her help was on the way as well as being a sympathetic listener. Jodie kept the first responding Fire and Medical personnel staged until the Deputies arrived and secured the scene. Throughout this horrendous call Jodie remained compassionate and professional with the caller, assured for the safety of her first responders, and made all necessary notifications. At the conclusion of this call the victim’s mother thanked Jodie for all she had done for her which truly speaks for itself. Jodie was once again on shift on the 15th of March when she answered a 911 call from a person reporting his neighbor had arrived home and found a burglar in his house. The home owner had the burglar at gun point while the neighbor was making the 911 call. Jodie did her best to gather what information she could while dispatching Warrenton Police Officers to the scene. Upon the arrival of the first Officer Jodie received a radio transmission from him reporting "Shots fired Officer Needs Assistance Suspect Down". Jodie quickly secured the channel, and confirmed that additional units were responding and aware of the situation. As it turns out the first Officer on scene was approaching the front door to the residence when the home owner fired a single shot of OO Buck shot from a 12 gauge striking the suspect. As soon as the cover unit arrived the Officers made entry to the residence and secured the weapon. Jodie had already dispatched Fire Rescue and the Ambulance and then began making numerous notifications as required anytime there is a major incident. Throughout the entire event Jodie remained calm, professional, and aware of all the Officers locations. Her excellent skills insured no first responders were endangered under extremely stressful and demanding conditions. Jodie’s actions are in keeping with the highest traditions of Public Safety dispatching. Astoria 911 Dispatcher Kristen Lane was recognized this past Friday during her Basic Telecommunications Academy graduation as the top academic Student. Kristen, along with two other classmates, finished the Academy with an overall academic score of 98.94%. The top academic student(s) in each Academy class is presented with the prestigious Carol Fagan Award. Carol was a communications specialist with the Eugene Police Department - Central Lane Communications Center. 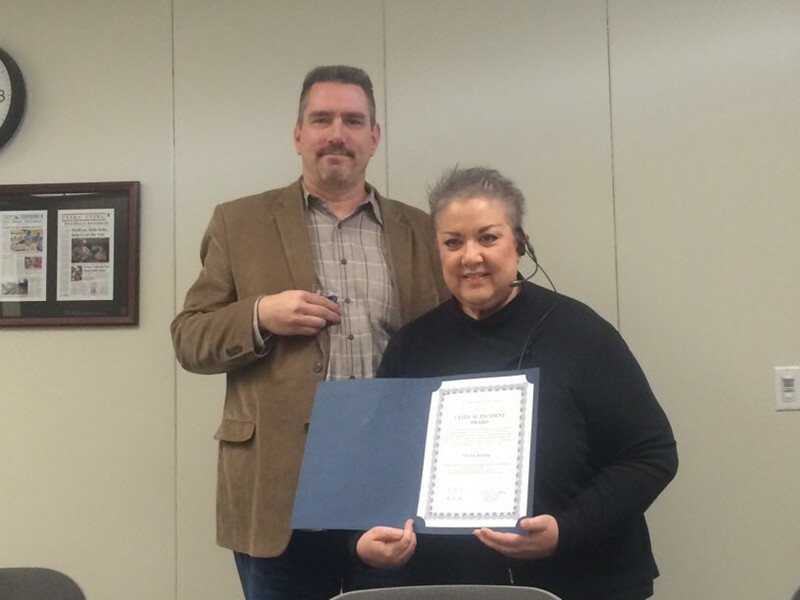 She was instrumental in the creation of DPSST's Telecommunications Training Program, which began in 1990. She served as an adjunct instructor at DPSST and was also very active in the training program at Central Lane Communications Center. Sadly, Carol died in a car accident in route to work for an overtime shift in Central Lane in 1995. Since this tragic event, the Basic Telecommunications Academic Achievement Award is named in her honor to recognize her commitment to excellence in public safety communications training. This achievement comes as no surprise to us as we have been extremely impressed with Kristen while she as been undergoing the demanding training to become a 911 Dispatcher for us said Astoria 911 Manager Jeff Rusiecki. All of us are very proud of her accomplishment! The Graduation Ceremony is held at the Department of Public Safety Standards and Training, in Salem.